We’ve all seen it before, the chameleon fireplace. For whatever reason, in decades past, designers thought it would be an awesome idea to have the fireplace blend in perfectly with the surrounding wall. They therefore painted the brick the exact shade of the surroundings robbing it of its focal point quality. If your living space features a chameleon fireplace all you may have to do is strip off those offending layers of paint (which admittedly can take hours of painstaking scrubbing) and let the natural brick underneath do their thing. Clean, seal, and finish off with a touch of gloss so that the bricks hold their appearance, and presto, updated space! If standard wood and brick is not really doing it for you, consider adding tile to the surround. A bit more modern, tile opens up a vista of opportunities, with its infinite combinations of styles, materials, colors and finishes. Whether you stick with smooth simplicity or opt for a more detailed tile that introduces a different texture to the space, tile always keeps things visually interesting. If you are up for something more daring and dramatic, extend the tile surround to create a stunning work of art. Because the fireplace is a statement piece and easily becomes the focus of the room, it is worthwhile to splurge on a more expensive tile that would be too pricey in a larger space like the kitchen or bathroom. In terms of upkeep, tiles generally offer bang for their buck as they can be easily wiped down, and will hold their appearance for many years. Sometimes the way to make a statement is with understated elegance, and smooth and simple plaster might be the best material for your fireplace surround. Plaster can give the illusion of depth and texture, but has a way of wowing in its austerity. 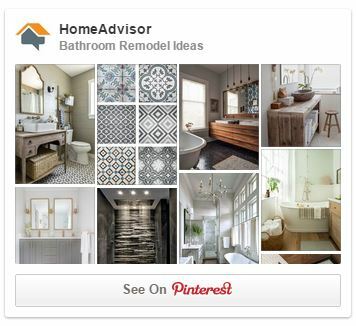 Ever versatile, it can be painted and finished to achieve just about any look, and you can draw color inspiration from other elements in the room to create a perfect balance. 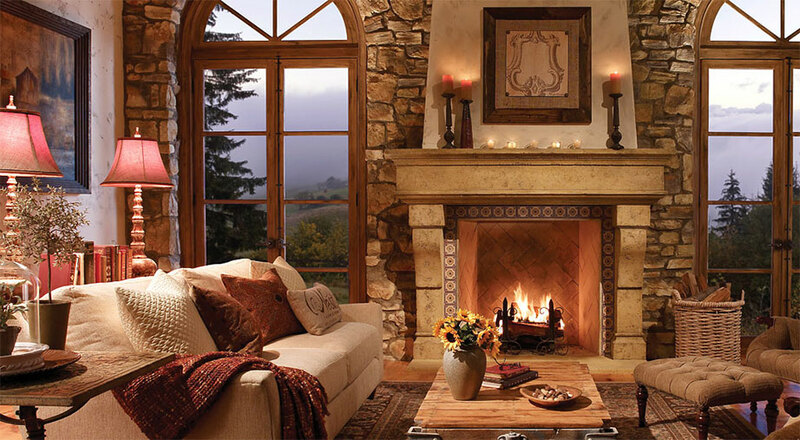 Sometimes the actual fireplace is perfect, but it is the mantle that’s got to go. 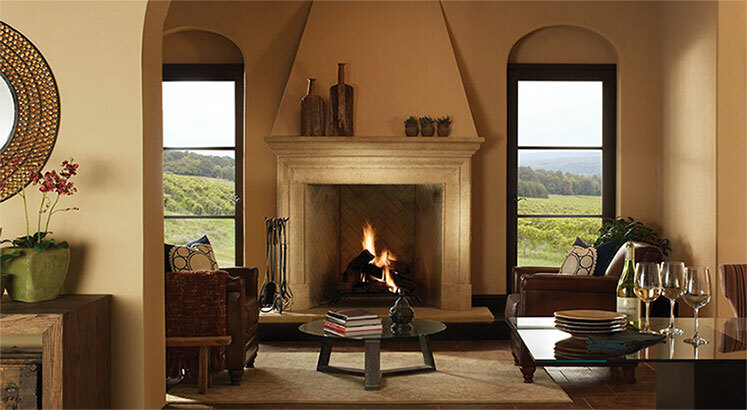 Mantle options run the gamut from opulent and ornate to mod and minimalist, and choosing the right crown for your fireplace depends largely on your sense of style. Another factor to be taken into account is the function. The right mantle will make it easy to dress the area over the fireplace, providing a shelf for artwork, mementos, mirrors and the like. As the holiday season approaches full steam ahead, now is the time to tackle the fireplace, and elevate it from eyesore to center stage. 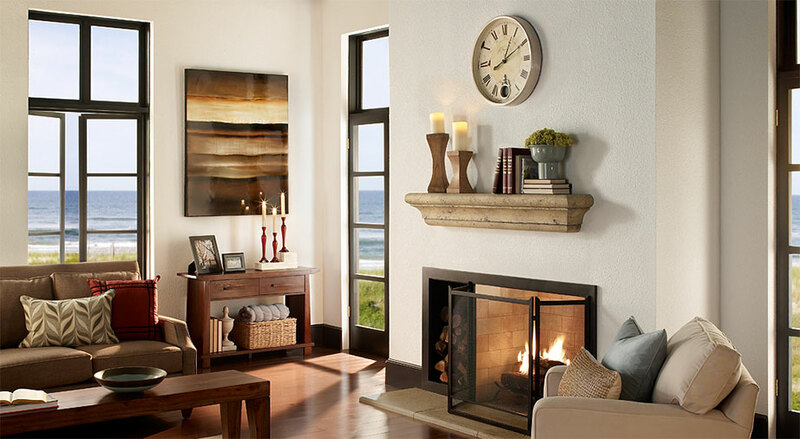 Add warmth, ambiance, and heart with a fireplace facelift that transforms the room.